- 3d Model description of the Human Brain. 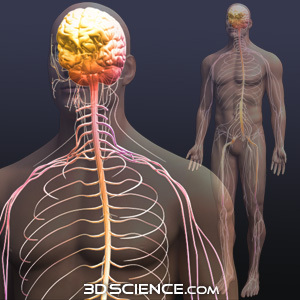 The human brain is the primary part of the nervous system and controls and regulates almost all bodily functions. The brain is complex and contains around one hundred billion neurons. The first image that you see is a rendered image of a 3d brain model. This brain model has parts of it grouped so that you can create cross-section view images. It is also interesting to note the coloring of the brain. We have access to cadaver labs and so we went and took some high resolution images of the brain and 'wrapped' them around the model we had built. So what you are looking at is quite close to what you would see if you were to peer into your skull and look at your brain. The images below have had some artistic enhancement applied to them so the brain and nerves look different than what they would look like in real life, although the placement in respect to the body is precise.